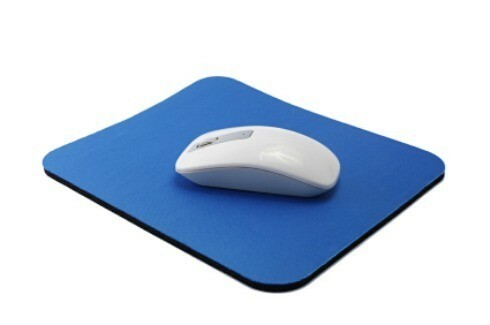 Rather than spending money on a new mouse pad, try cleaning the one you have. This is a guide about cleaning a mouse pad. Our mousepads are the basic, inexpensive type, made with a rubber-type base, covered with synthetic (I think) cloth. After a year or so of just normal use, they had dirty smudges around the edges (from our hands and wrists). I put about a teaspoon of Woolite into a small dishpan and added enough water to cover the mousepad. I let the mousepad soak for about 20-30 minutes, then scrubbed lightly with a soft bristle vegetable brush. I rinsed it thoroughly, then rolled it in a towel to get out the excess water. Then, I hung it over a chair back and let it dry overnight. Clean! Source: I decided to try this because the mousepads are similar in materials to my arch support cushions, and that's how I clean them. I thought my mousepad was worn out and ready to be replaced, until I got the idea of cleaning it with a piece of masking tape. I rolled the masking tape inside out, around my fingers, and proceeded to use the sticky side to pick up lint. Now the mousepad is good as new!